Instruction To Use: Remove water before cooking. 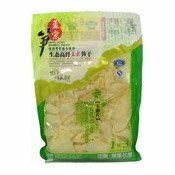 Ingredients: Dried Bamboo Shoot (65%), Water. Simply enter your details below and we will send you an e-mail when “Boiled Dried Bamboo Shoots (Superfine) (玉蘭竹筍)” is back in stock!